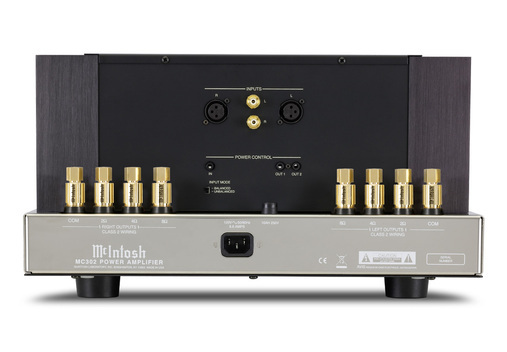 Born 65 years ago, Mc Intosh Laboratory Inc. has a track record of uninterrupted successes. In the Hi Fidelity sector no other brand achieved this goal. JBL, for an instance, was born earlier but for almost 20 years fell into an obscurity from which arose only few years ago. All the glorious brands of the 60's and 70's are nowadays only an item for the vintage lovers. McIntosh is a brand that bewitches and this is a fact. Everyone's enthralled, not only its supporters. Those that seem to be indifferent in the end are only being snobbish with that attitude typical of all enthusiast audiophile. In my 50 springs I have seen many meteors cut through the firmament of the Hi-Fi world and I remember well the desire to possess those huge silver amplifiers with handles that were displayed at the entrance of Milan's Auditorium 11 beautiful shop. These were objects of desire that at the time had some alternatives that today do not exist anymore. Remember those big Harman Kardon? The SAE? The BA series of Sansui? Power amplifiers were the objects of desire for young generations, they had a mighty appearance and had the power to make the loudspeakers play loud. The pre amplifier was considered something necessary in order to manage the sound that came from the turntable or from other sources and to record reel or cassette tapes. It was a sort of control centre and we didn’t realize how important it was to obtain the sound we wanted. The years have passed and many brands have appeared and disappeared again. 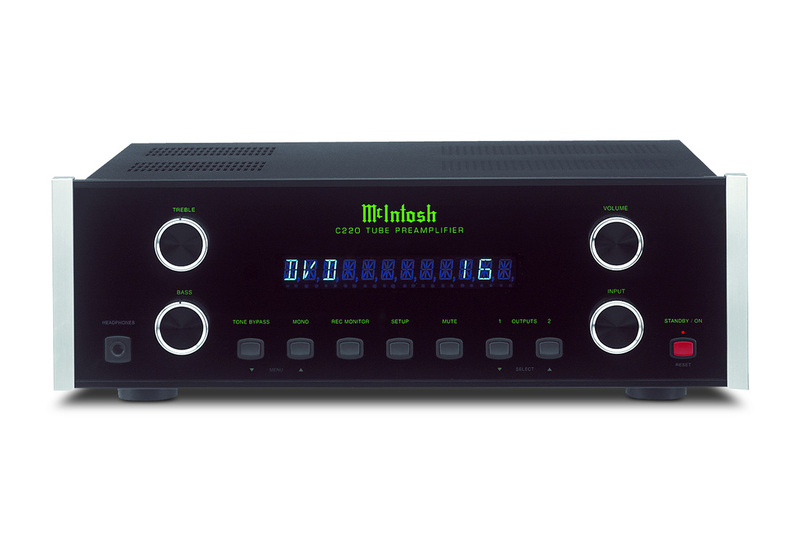 McIntosh has been a constant presence in the world market with a wide range of products that pleased all customers and music lovers. Well, almost everybody because prices were a bit too high to be popular. There are trends, tendencies and styles also in this sector. Valves come and go and their counterpart are the transistors. Paper in loudspeaker's cones has been replaced many times by any available material to come back after a while with strength because people preferred it. The Italian market considers McIntosh an evergreen. We are talking about a brand that is always stable, that knows no sudden downturns or sales boom. 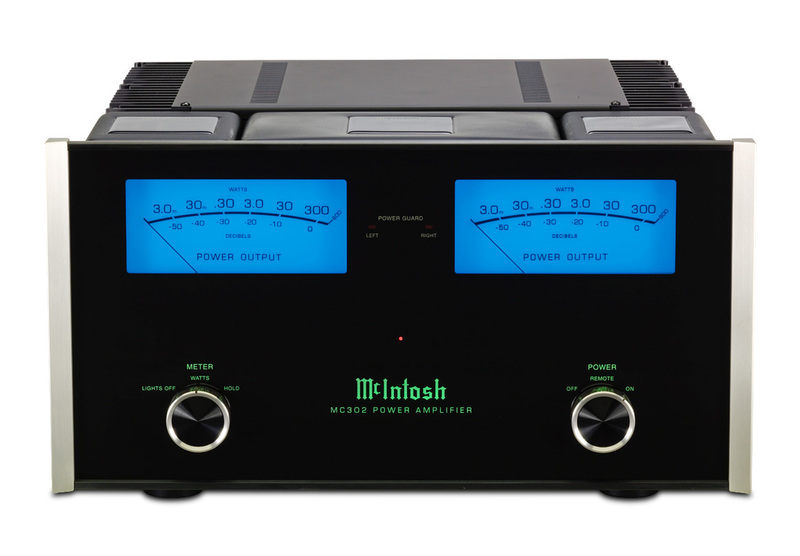 McIntosh has recently been acquired by an Italian investment fund and is part of the group Fine Sounds together with Sonus Faber, Wadia and Audio Research, and employs around 150 people in the US plant of Binghamton. I have long desired to test these components in my system. I'm not ashamed to say that they have a strong appeal on me and that my opinion was influenced by the commonplaces heard. Commonplaces that had been partially debunked not long ago after a close listening of the integrated amplifier MA7000 with Domenico Pizzamiglio in the occasion of his review for a paper magazine. Furthermore my experience in this field tells me that it is absolutely possible to design audio components that are both beautiful and sound efficient. With a lot of curiosity I have sent an e-mail to the Italian McIntosh distributor MPI, asking for a couple of amplifiers to test. The answer came straight away and, in the twinkling of an eye, the C220 preamp, together with the MC302 amplifier were bound to my listening room. While waiting for the components to arrive I was a little bit worried; what if the sound is not up to the quality and luxury of the look of the electronics? It took only three minutes to see all worries disappear but I'll relate about this after having introduced the two machines. 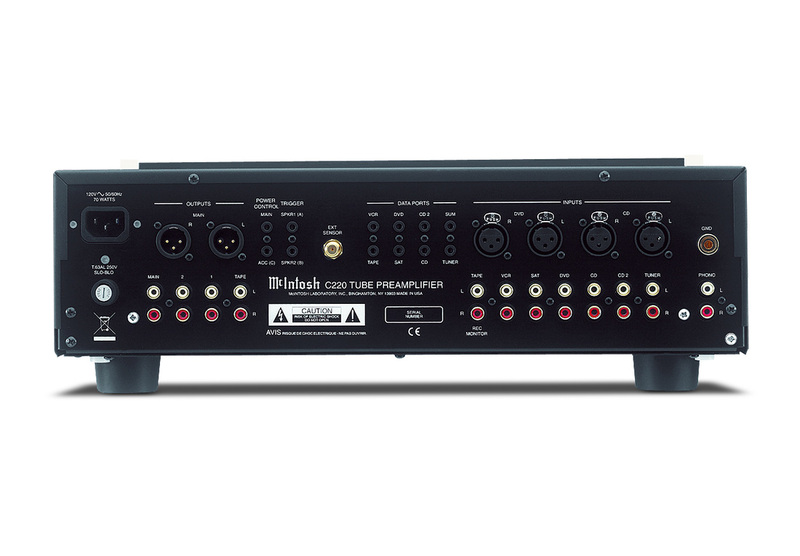 The C220 is a very complete preamp if we compare it to the standard of today's design. The 4 big knots control respectively treble and bass levels, volume and input selection. We have then the headphone output and a row of black switches for: bypass, tone control, mono, rec monitor, set up, mute and the 2 output selection for more power amplifiers beside the main one. Then there is the red switch-on button. In the center of the panel there is a big display with light blue typeface that indicates the selected input and the level of the volume. The green enlightened brand is a must. The back panel is very crowded, there are: IEC input, power supply fuse, tape out, input for the switch-on trigger of other components of the firm, 2 balanced and 8 unbalanced input and the phono input. This preamp accepts a turntable with a MM cartridge. The electronics included in this amplifier give the possibility to program the balance control, to control the level of input of the different sources that is independent for each one, to name each input, to control the display brightness and other features. You can even decide to leave on or off the green LEDs that light up the 4 12AXA7A valves assembled inside. Very peculiar is the possibility of switching off the phono section amplifying valves when not needed. The remote is a multifunction and can control a series of Mc components (but can be set up also for other brands) and is thus crowded of keys. Its aspect is a little bit cheap but it's nice 'cause once in use the keys light up. The preamp is solid and well refined and weights almost 10 kilos. The power amplifier, MC302 is a 300W RMS each channel. The front panel has two big knots respectively for the beautiful azure VU meter and for the selection of their function mode: continuous output power range measuring or momentarily peaks block.The other knob is the on/off switch. The rest of the description is left to the picture. The back side presents 8 strong proprietary binding posts that accept wires with any end that can be used depending on the impedance of your loudspeakers. The output transformers usually employed even by solid state MC's, allow the same power output on 2 ,4, 8 Ohms. We find then the power cable and signal cable input, balanced and unbalanced. What about their appearance? A mix of austerity and lavishness, a classic line far from those kitsch achievements that are fashionable today. Shape, function and that touch of class that makes these components fit for any furniture style. The components have been listened in the following system: Turntable Basis 2001, Graham 2.2 tonearm, Scan Tech Lyra Helicon cartridge, phono cable: LAT International XLR, phono preamplifier: balanced Einstein "The Turntable's Choice", cable between the phono preamplifier and line preamp: Transparent Super XLR, CD/SACD player dCS Puccini+U-Clock Puccini, loudspeaker JBL 4350B, loudspeaker cables: MIT Magnum MA, power cables: MIT Shotgun AC1, Black Noise Pearl and others hand made, net filter: Black noise 2500. The two components were brand new when they arrived so we had to burn them in. Some say that this is not necessary but I can assure you that, in this case, a proper burn in changed the sound sent to loudspeakers. Boy if it changed! At first the sound was muffled and slow at bottom end, and this reminded me of the theatre in which I heard a dress rehearsal of a symphonic music concert, just some days ago: the sound was the same. After five hours, more or less, the sound had changed and it was the exact opposite. A sharp low and a treble close to being annoying. After 15 hours the sound was so different that I suddenly text messaged a friend telling him that these components are the exact contrary of all commonplaces and urban legends told on the McIntosh sound. During the burn in I listened to DVD "When in Rome" by the Genesis. In "Afterglow" I realized for the first time how different is the Chester Thompson’s snare drum from the Phil Collins’ one. The latter sounds sharper and more acute having a shorter shell. Once burned in the components I can start with the review and the first CD I listen to is“Siria” by Antonio Placer, (Harmonia Mundi). It's a record of stories written and performed by the galician poet and songwriter. The songs are mostly performed with two guitars and a bass. The recording is excellent as it always happens with Harmonia Mundi. The bass is always present and sometimes it is blown and not very precise. 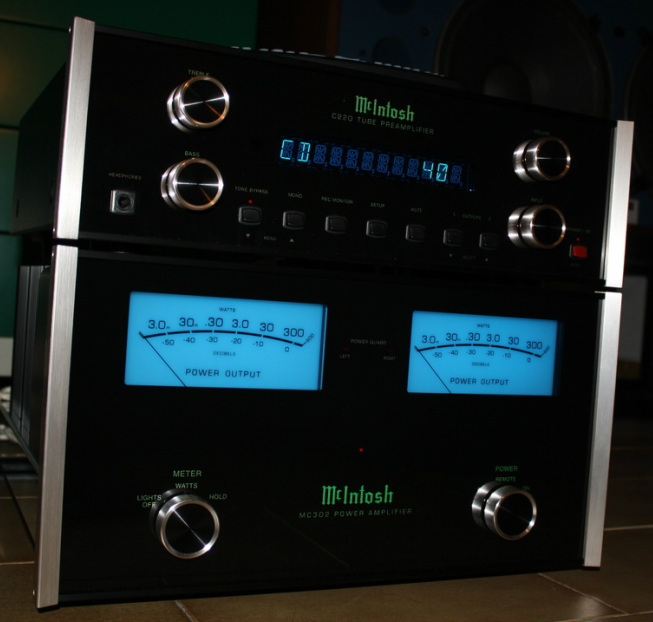 But with the McIntosh everything sounds right. The thicker metallic strings of the guitar are never predominant on the thinner nylon ones. The instrument has the right dimension and its tonal balance is never too grave. Placer's voice is beautiful up to the best electronics heard in the last years. In "Wish You Were Here" by the Pink Floyd the low range is very good, the medium-high is a little bit in evidence and the treble is withdrawn and takes away something from the cymbals but has a very good resolution in every passage. All the transients of "Welcome to the Machine" have enough dynamics and sound a little bit tamed but it's no big deal if you think of all the positive values of an excellent vacuum tube design. I wanted to test harder all the dynamics and speed issues so I took a Telarc SACD, "Jacques Loussier Trio - The best of Play Bach". It's a record that artistically is not worthy (in my opinion, of course) but the recording is among the best of Telarc. In the track number 4, the Presto of the Italian Concert, I listened to the most natural and real snare drums ever. It's a perfect mix between the sound of the drumhead and the rim/shell of the drum. Many compliments to Telarc and McIntosh but unfortunately nobody's perfect: the cymbals of the drum set are a little bit drawn back, though reproduced with the right color. Very pompous and beautiful the piano in "Toccata and Fugue" far from those unnatural but frequent exaggerations in the medium low range. I test again the speed of the two US components with the CD "Appearance" by Triplicated (Organum) a recording with the most terrible transients ever. The appliances pass the test with flying colors. They do not reach the peaks of speed and force of my reference system but they keep up to it. The saxophone and the double bass engage the listener while treble sound percussions are a little bit dimmed. The Officium by Jan Garbarek with the Hilliard Ensemble (ECM) testify the beautiful resolution of the saxophone reproduction with the reed vibrations in the right evidence and the voices very well positioned in the space of the Abbey that hosted the performance. Around the 15th minute of the first track "Inside Out " (ECM) by the Jarret, Peacock, De Johnette trio, the percussion brushes barely touch the drumhead but the two McIntosh reproduce perfectly this low intensity signal. The three instruments of the group are recorded with rare prowess by the German label and are reproduced with plainness, speed and a good dynamic contrast. What can I say in just a few words about the sound of these components? I'd rather use an adjective that comprises many sensations: captivating. Yes, captivating. Part of this judgment is due to their appearance and it is absolutely understandable why many people fall in love with the McIntosh sound an stick to it. It's a sound that is not cold and neutral but at the same time it's not colored and interpretative like that of some valve components of some Japanese "Guru". But here we have to be clear and let the reader know if they are components that make the record play in an authentic way. Think about an Opera performance: the role of the female lead must be sung respecting the author's directions, of course. So: Callas or Tebaldi, just to say two names at random? It's a matter of preference or propensity but no one can say that one of them wasn’t a great singer. The same thing applies to these electronics: they have their own sound, their own way of reproducing music. What I know is that a McIntosh sooner or later will be included in my audio system for the reasons exposed above but also because you can't rule the heart and with them I felt real good.